WASHINGTON TOWNSHIP - The veterinarian who pioneered a stem cell procedure on an injured horse two months ago says the horse is 50 percent healed. Dr. Brian Burks of Fox Run Equine Center is the first in the region to perform the stem cell procedure on a horse in his office instead of sending the horse's fat to a lab for processing. Wilson, a 7-year-old quarterhorse from West Virginia, suffered an injury to his right rear stifle, the equivalent of a human knee. Burks used Wilson's adult cells - called repair cells or regenerative cells - to repair the injury. They are not embryonic cells, whose use in human patients is controversial. In April, Burks cut pieces of fat from the horse's hindquarters, drew its blood and spun both in a centrifuge, separating out the useful bits. Enzymes were added, and the materials were filtered many times. The cells made a platelet-rich plasma, which was place under an LED light. That activated the stem cells. Finally, the stem cells were injected into the horse's stifle to rebuild the cartilage. "I think he's definitely better," Burks said during a checkup last week. "Not perfect, but definitely better." Wilson is a third of the way through his recovery. Healing will continue for about six months from the surgery, Burks said. During the checkup, Burks watched Wilson trot in a line and in a circle. He then checked the repaired area using a ultrasound machine. "That discrete tear that was there before is gone," Burks said. "He's got some healing to do, but it's coming." In an ultrasound image taken before the procedure, a large tear in the meniscus was visible, Burks said. "Traditionally, the meniscus is something that didn't heal," Burks said. "In the past, that would be a death sentence for the horse, or at least (send him to) pasture." But using stem cell technology can allow horses to heal, even allowing them to enter shows again, he said. The area where the fat was cut has already healed, and the hair has grown back. Wilson was on stall rest after the procedure, according to his owner, Cynthia Harr, but it didn't take long for him to begin showing improvement. "In two to three days after he had the treatment, he was jumping in the stalls," Harr said. "You could tell he was feeling fantastic." She hopes to take Wilson to horse shows by next spring. Since Wilson's procedure two months ago, Burks has treated a dog and three other horses, including another belonging to Harr. Wilson's procedure cost about $1,800, while the cost for a dog ranges from $1,200 to $1,300. "I think it's definitely worth it," Harr said. " There's a lot of other things we've tried that we haven't seen results with." Dr. John Payne, a surgeon at Pittsburgh Veterinary Speciality and Emergency Center said his office has used stem cells from fat to help arthritic dogs. His office sent the fat out for processing, rather than processing it in office. Payne said he wasn't too impressed with the results, and that he'd put the procedure in the category of "alternative medicine." "We tell people when we do this that it's very new, there's very little proof as to how effective it is," Payne said. "It's one of those things that probably is not going to be harmful, but it's very expensive. And, again, the proof of efficacy is pretty scant." Though some still question the procedure's efficacy, stem cell treatments are piquing the interest of doctors, too, according to Dr. Scott Hopper, a surgeon at Rood and Riddle Equine Hospital in Lexington, Ky. The hospital one of the largest equine hospitals in the world, and treats more than 100 horses each year with stem cells from bone marrow. "A lot of the M.D.s are very interested in it because they need animal models to eventually get to a clinical trial in humans," he said. The writing's on the wall, Hopper said: Someday doctors will be able to regenerate different organs or tissues for people. To Dr. Freddie Fu, chairman of University of Pittsburgh Medical Center's Department of Orthopaedic Surgery, the stem cell procedures in animals could hold promise for humans, but it must be studied. "There are no studies, scientific studies, done to show one way or another," he said. 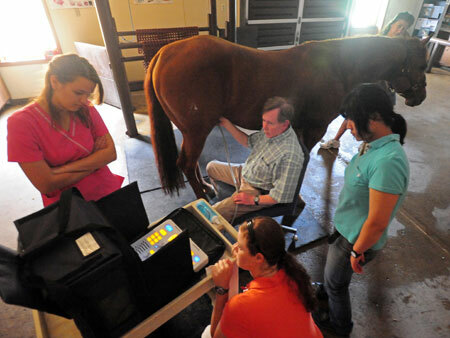 Dr. Brian Burks shows veterinary interns (from left) Sarah Edmiston, Jill Dentel and Ayaka Matsuya how to analyze the ultrasound results of Wilson, a 7 year-old quarterhorse from West Virginia, during a checkup this past week at the Fox Run Equine Center in Washington Township. Wilson had a stem cell procedure done two months ago to repair a tear in his meniscus.